Titanium & Niobium Sworavski Crystal Post Earrings at Wear Earrings Again with Maggie's Creations - Non-Allergenic Jewerly, guaranteed! 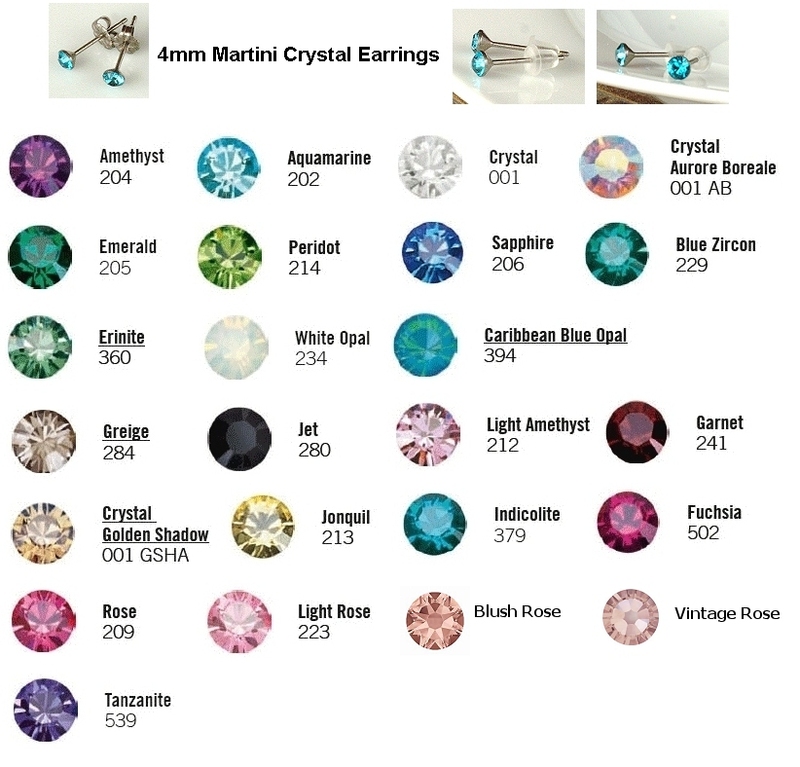 The earrings on this page are created with Beautiful Top Quality Swarovski leaded crystals, unless otherwise noted. They are either set on PURE (non-alloyed) Titanium Settings, or Surgical Implant Grade Titanium (ASTM F136) settings. All items are fully described. Itty Bitty. 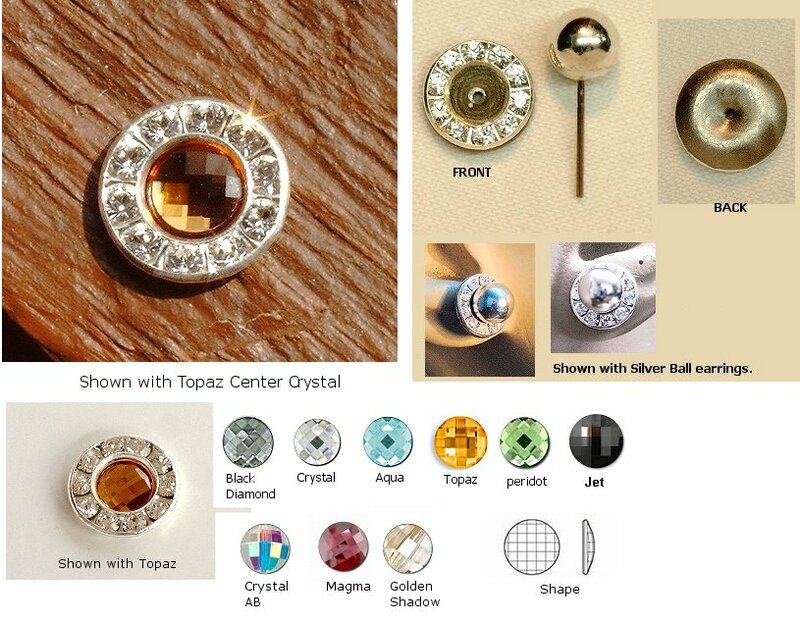 CZ/crystals bezel set (no glue) into solid one piece Implant Grade Titanium. 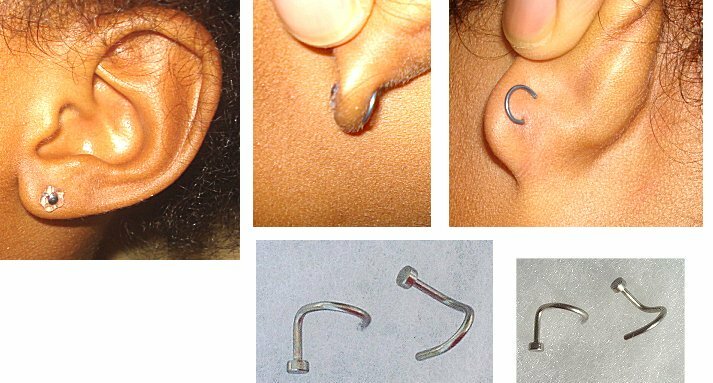 Choose a Regular/Standard post length (which will fit up to a 7mm earlobe thickness), or Long (which will fit up to 10mm). Or you can request a custom sized post length if you prefer. Silicone Clutches are included. 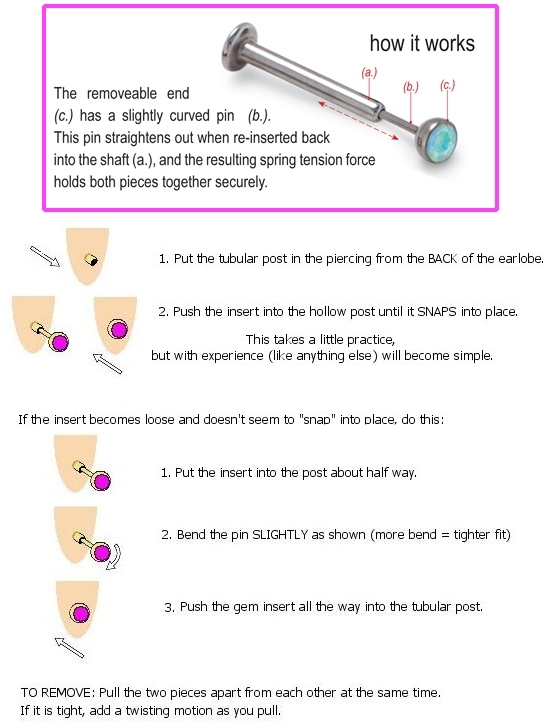 * Makes perfect Nostril Screws or Cartilage earrings! Fits perfectly with my change-able donuts! 4mm Crystals (not swarovski) in Titanium Bezel Cup Settings. Very Pretty & Sparkly! 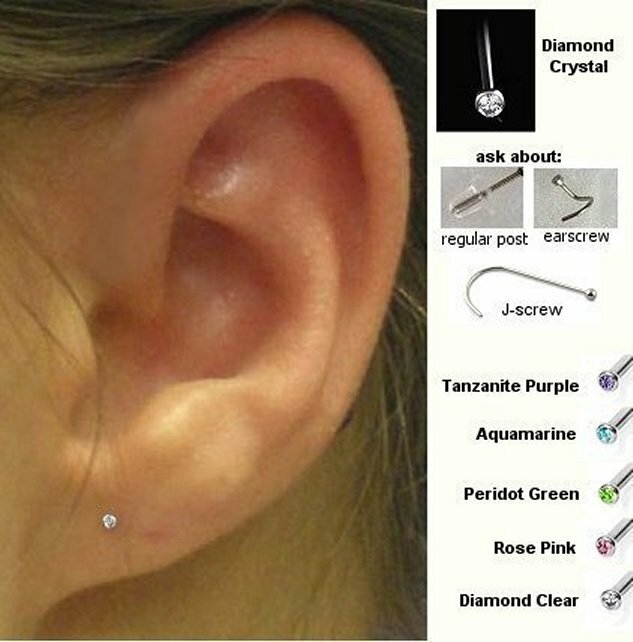 Perfect forever earrings. 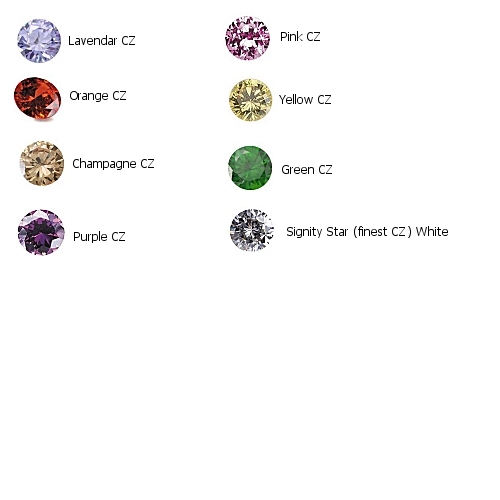 4mm diamond colored Crystals in Surgical Implant Grade Titanium Bezel Settings (no glue). Standard post lengths which will fit up to a 7mm earlobe thickness. Clutches are included. Surgical Implant Grade Titanium Alloy (TI 6AL4V ELI) can be worn by all who have achieved healthy piercings - but I do not recommend it for new piercings or piercings currently suffering with Eczema. Pure Grade Titanium (Ti) RIMMED MARTINI CUP AND POST SETTINGS! I've designed this setting to be manufactured for me in Pure Grade Titanium! They are 100% Non-allergenic. Available in "Regular" (standard) or "Long" (up to 10mm earlobe thickness) post lengths. Clutches are included. 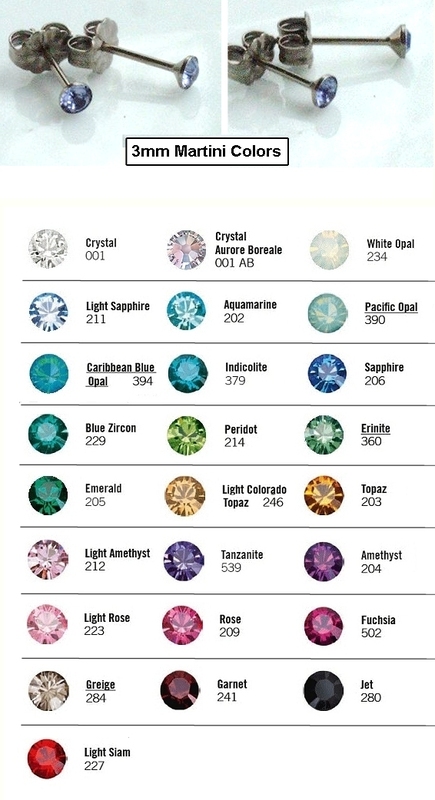 Many beautiful crystal colors to choose from. 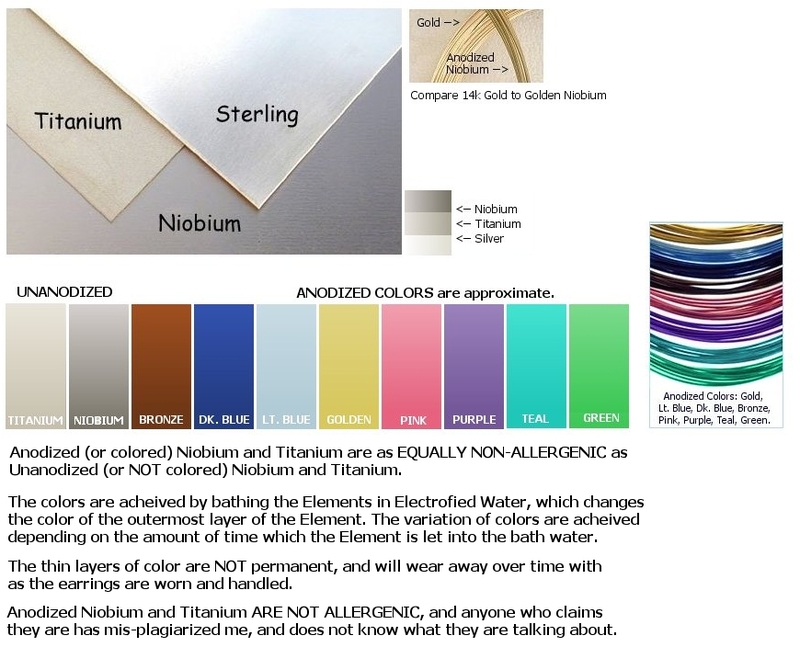 Jewelry which is epoxy set, should not be soaked or worn into water, or it could loosen the crystal from it's setting over time. Pure Grade Titanium Shallow Cup Earrings! I've designed this setting to be manufactured for me in Pure Grade Titanium! They are 100% Non-allergenic. Available in "Regular" (standard) or "Long" (up to 10mm earlobe thickness) post lengths. Clutches are included. Pure Grade Titanium (Ti) Shallow Cup & Post settings! I've designed this setting to be manufactured for me in Pure Grade Titanium! They are 100% Non-allergenic. Available in "Regular" (standard) or "Long" (up to 10mm earlobe thickness) post lengths. Clutches are included. 8-9mm Swarovski Crystal Occasion Earrings. 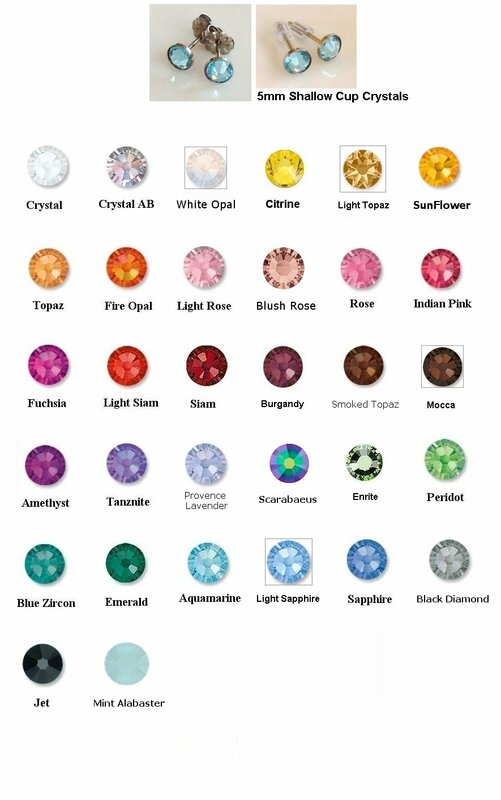 Beautiful Crystals are epoxy set onto Pure Grade Titanium post and pad settings. Titanium clutches are included. Standard length posts. 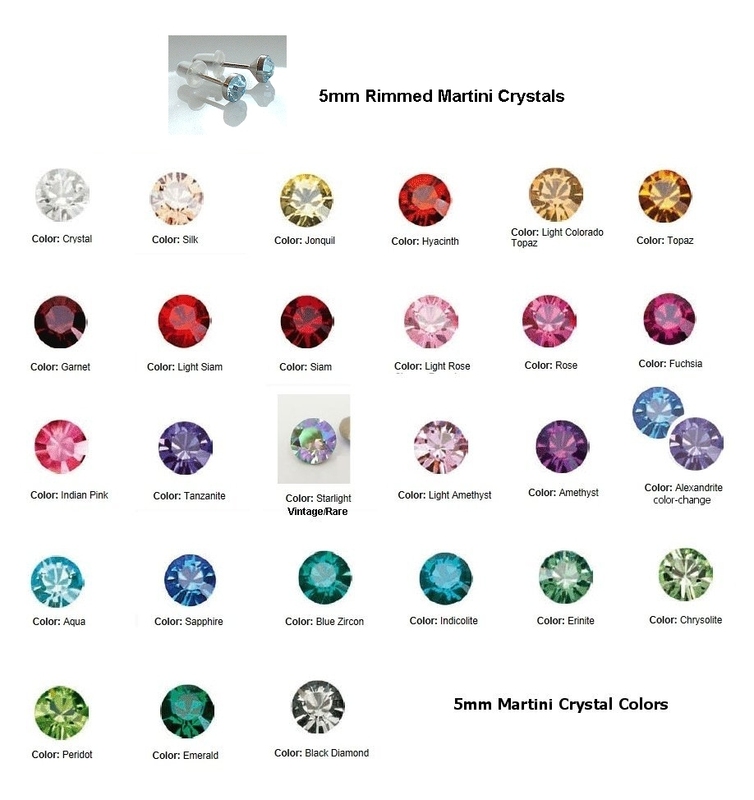 10mm Swarovski Crystal Performance Earrings. 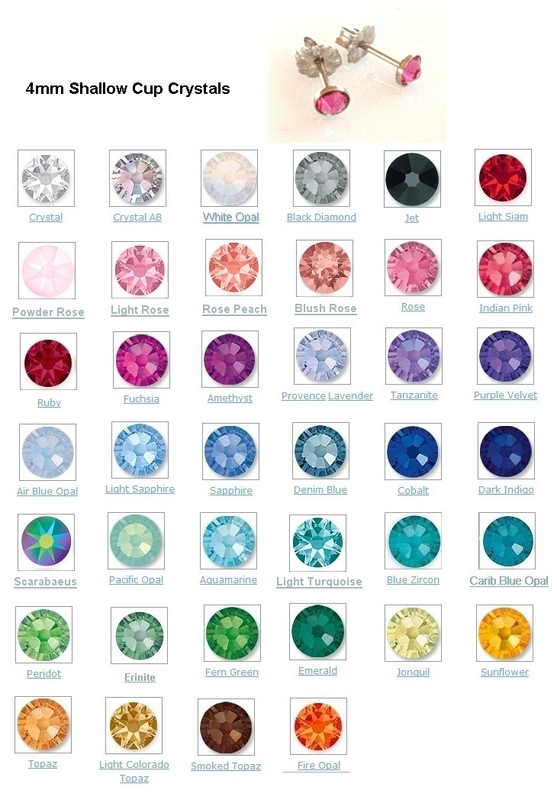 12mm Swarovski Crystal Performance Earrings. You don't have to be a performer to shine like the stars!! 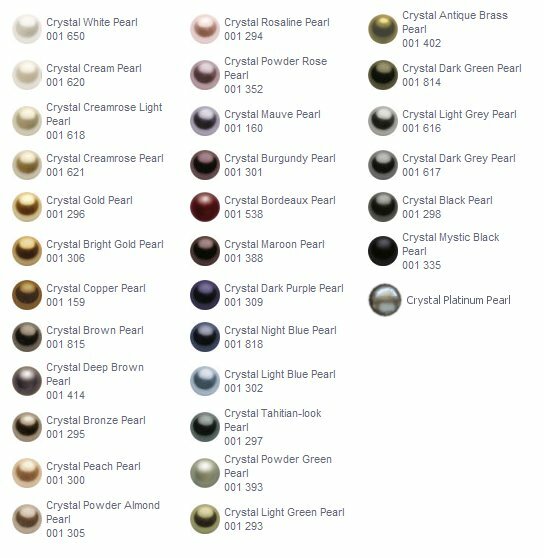 Beautiful 6mm Chessboard Crystals (available in your color choice) are epoxy set onto Pure Grade Titanium posts and pad settings, and embellished with beautiful 12mm crystal studded frames in silvertone metal. Clutches are included. Titanium earrings come with standard post lengths. Email me for prices of custom made Titanium or Niobium settings in any size post length.